November 7, 2015 November 7, 2015 Lisa A. Thank you so much to Chape for nominating me for this awesome award. I was nominated for this award two other times. I will do the posts for these at a later time. *I’m left handed but write with my right. Why? Because I went to a private school with nuns and they forced me to write with my right. I tried writing with my left hand again but it’s pretty hard. *Even though I’m left handed, I can throw and catch a ball with both hands. *I enjoy cooking but I hate cleaning up afterwards. I wish I had more time to do it but I’m usually running around with my 9 year old and I’m tired when I get out of work. *My favorite beer is Bud Light. *I love to read. Reading allows you to learn new things everyday. *When I was a freelance writer, I got to interview several bands and comedians. Some included Transiberian Orchestra, Godsmack, Larry the Cable Guy, Breaking Benjamin, Queensryche, Chicano rappers Lil’ Rob, Brown Boy,DEVO, etc. *The funnest class I ever took in my life was wine tasting. All we did was eat delicious food and drink wine in the class. Lol. * I still like talking on the phone, even though I don’t do it as much. *Me and my mom both have tragic birthdays. My birthday is 9/11 and hers is November 22, the day John F. Kennedy was assassinated. *I’m a big fan of the History Channel, especially of the show Pawn Stars. *I’m a picky eater but I still love to eat! My health, family, true friends. How much do you enjoy what you do for a living? I don’t really enjoy it. I would rather be writing about fun stuff like music and concerts, etc. It’s just a job I have to keep because I haven’t found another one yet. I get to write at my job but not the way I want to. What would be the hardest thing (physical) for you to give up? Right now, my struggle is giving up sweets and soda. I’m trying to do it because I want to lose a few pounds. When is the last time you’ve gone outside of your comfort zone? Maybe about a month ago. I don’t like it but I know it’s necessary. What painful situation are you now most grateful for? An ex fiance breaking up with me. Being stuck at a dead end job forever. I’m working on it though ;). How and where do you like to spend your holiday? Relaxing in nice, sunny weather. I would say going to Orlando. Getting back into writing and meeting bloggers from all over the world. I’ve also enjoyed interviewing fellow bloggers and others. What are your goals for your blog in 2016? I expect my blog to grow in readership as I bring in more interviews and fun posts for everyone! I’m considering leaving my day job in order to work on writing and blogging more. What’s one of your favorite memories as a child? If you had to read a book more than once, which book would it be? What do you write about most in your blog? Who are you the closest with in your family? What has been one of the saddest days in your life? Thank you so much for nominating me. All the best! I used to have a crush on him! My fav song of his is Not to touch the sun? LOL. What a funny video! This guy REALLY hates Bud Light! Thanks! Thanks for also participating! 🙂 Congrats to you too! Yea I understand 11 is a lot! I’ll go check it out. Congrats! I’m about to post my answers shortly. Bailed on the eleven nominees, though I did list eleven questions if anyone wishes to take a crack at them. Ohh ok! 🙂 I thought you were home. Be safe! Thank you for reblogging! The lovely Amaya nominated me for this beautiful award. Thank you so very much, dear friend. I appreciate it so very much!!! Because of my trip home today and for sure a lot to do when I arrive tomorrow evening I reblog. See you all soon! My congratulations to this wonderfufl award, Amaya. This is such a beautiful one! Oh, wow, and I thank you so very much for the nomination! 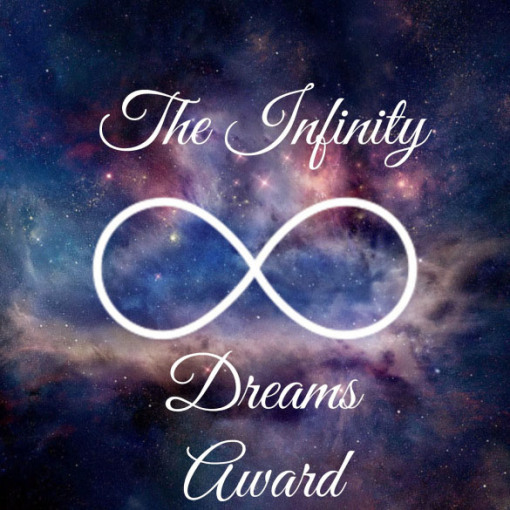 I love the Infinity Dream Award since I am such a dreamer! I am flying home today. So I hope you don’t mind if I just reblog your post in order to honor you for receiving your award and for nominating me. It was! I will post it at a later time 🙂 Thank you again for nominating me! Congratulations!!!! Thank you so, so much for the nomination. Lol yes! Well in that class it did anyway. The professor was a chef so the man cooked really well! We had to know which wines tasted good with which foods so food needed to be included! We ate steak, turkey, different cheeses, etc. I know you nominated me for this award too and I haven’t forgotten you! I’ll do your post soon 🙂 Thank you for the award and for reading the post! Does wine tasting also include eating? Thank you for nominating me! 🙂 I’m glad you enjoyed it. I’m still left handed lol. I now just write with my right hand.